Mysterium Cosmographicum, (lit The Cosmographic Mystery, alternately translated Cosmic Mystery, The Secret of the World or some variation) is an astronomy book by the German astronomer Johannes Kepler, published at Tübingen in 1596 and in a second edition in 1621. Kepler proposed that the distance relationships between the six planets known at that time could be understood in terms of the five Platonic solids, enclosed within a sphere that represented the orbit of Saturn. 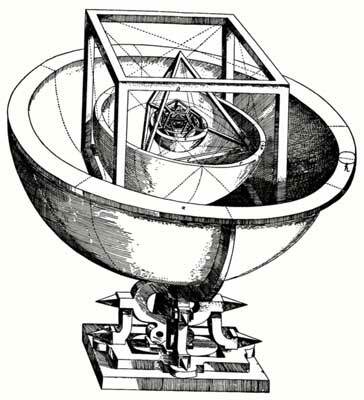 This book explains Kepler's cosmological theory, based on the Copernican system, in which the five Pythagorean regular polyhedra dictate the structure of the universe and reflect God's plan through geometry. According to Kepler's account from this text, the ratio was brought to his attention accidentally while demonstrating the calculation of the ratio between a circle and a circle created by a rotated inscribed circle. From this he realized that he had stumbled on the same ratio between the orbits of Saturn and Jupiter. He wrote, “By a certain mere accident I chanced to come closer to the actual state of affairs. I thought it was by divine intervention that I gained fortuitously what I was never able to obtain by any amount of toil.” But after doing further calculations he realized he could not use the two-dimensional polygons to represent all the planets, but instead he had to use the five Platonic solids. The Mysterium Cosmographicum was recently featured on the Austrian 10 euro Johannes Kepler silver commemorative coin minted in 2002. The reverse side of the coin has a portrait of the contemporary scholar and astronomer, Johannes Kepler, who spent some time teaching in Graz and the surrounding areas. Kepler was acquainted with Hans Ulrich von Eggenberg personally, and most probably he knew and influenced the construction of Eggenberg Castle (the main motive of the coin). 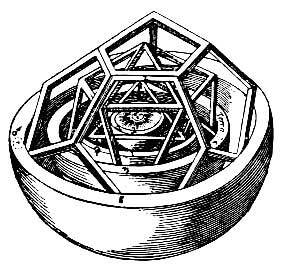 In front of him on the coin is a model of his master piece, the“Mysterium Cosmographicum”. * George W. Hart, "Johannes Kepler's polyhedra"